Ah, the touring car racing-inspired road car. Who could forget the BMW M3 Ravaglia, the Alfa Romeo 155 Silverstone, even the Vauxhall Astra Coupe 888… good times. Now there’s another (sort of): the VW Golf GTI TCR. What does TCR stand for? Touring Car Racing, a formula that’s taken over the world of saloon car motorsport. It’s designed for production-based cars, sharing some of their components with their roadgoing counterparts and so it’s (relatively) lower in cost than traditional high-end touring car championships like the BTCC. It’s also designed for customer drivers and teams, rather than full-on factory racing squads. It took off in 2015 and there are now national and international TCR championships all over the world. And one of the front-running cars is Volkswagen’s Golf TCR race car, built by VW’s customer racing division. 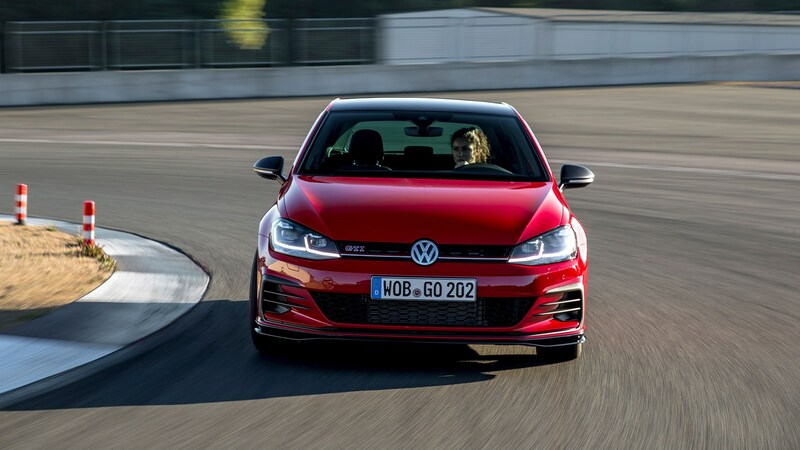 Hence why VW has chosen to name this new, slightly faster, harder version of the Golf GTI hot hatch after its racing cousin. Ooh, so it’s a lairy track special with box arches and a stripped-out interior? Not really. The Golf GTI TCR is an uprated version of the existing Mk7.5 Golf GTI Performance, which is now the entry-level GTI model in the UK (the previous base GTI has been discontinued due to WLTP homologation). 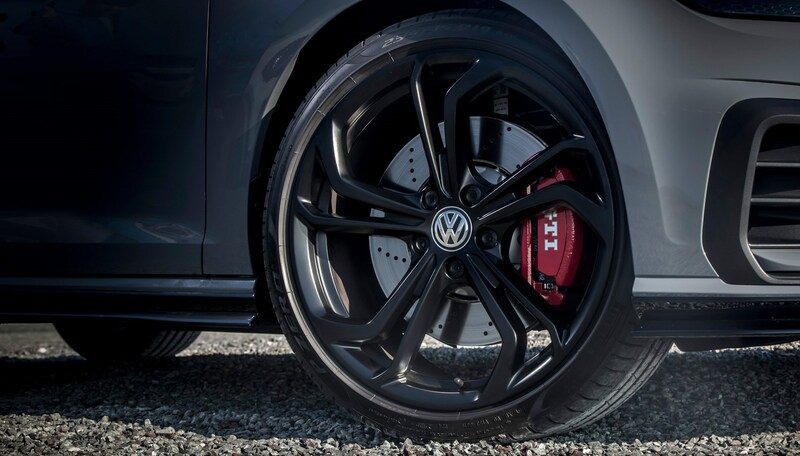 Like the Golf GTI Performance, the GTI TCR has a locking differential as standard and sits 20mm lower than the standard Golf, with altered spring rates and damper settings. 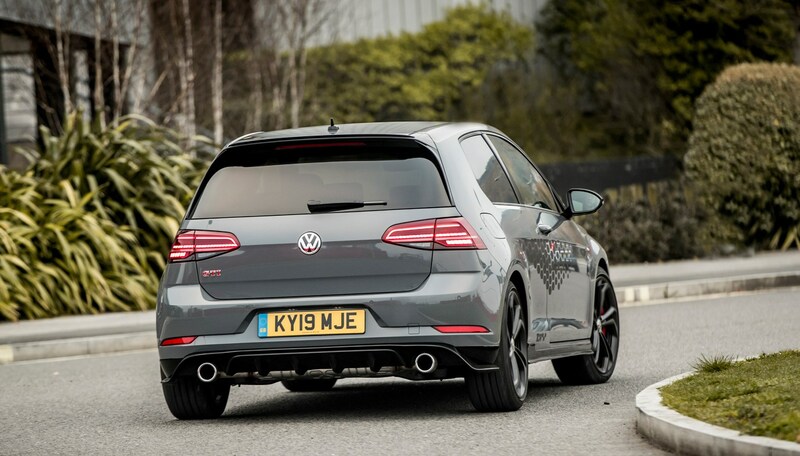 Pick the optional DCC adaptive dampers and the ride height sinks a further 5mm lower than the GTI Performance. The TCR is available with either three or five doors, but there’s no manual gearbox option – it’s dual-clutch DSG only. That in itself can genuinely claim to be a direct link to the racing car, as the base version of the racer uses the same paddleshift ’box as the road car (although top-spec versions are fitted with a racing sequential transmission). The GTI TCR is a series production car, not a low-numbers limited edition. Its production is limited by time, however. This car represents a last hurrah for the Mk7.5 Golf. The all-new Golf Mk8 is on the way, and will make its public debut later in 2019. What exactly makes the 2019 VW Golf GTI TCR different from the GTI Performance? 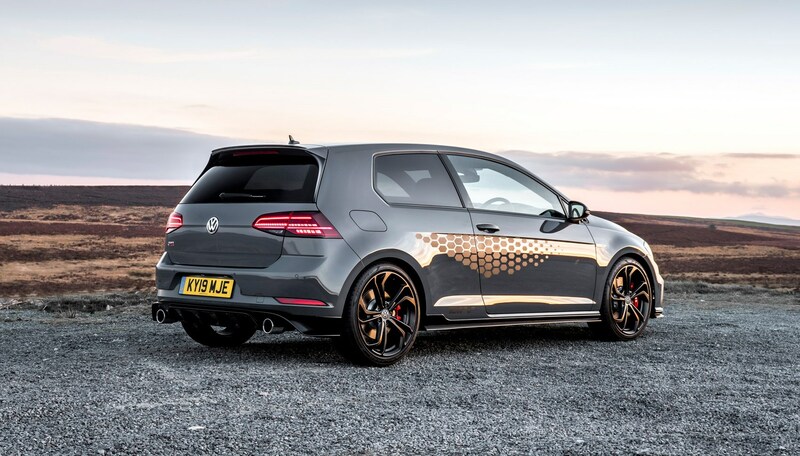 Apart from the aforementioned suspension retune, its 2.0-litre four-cylinder turbo engine has had a remap and a new stainless steel exhaust to push its power output to 286bhp, a 44bhp increase over the GTI Performance. That’s a lot of power for a front-wheel-drive car, although the erstwhile (and brilliant) two-seat special Golf Clubsport S put out more than 300bhp. There are two extra radiators, as per the more powerful all-wheel-drive Golf R, to help with cooling. The brake discs have been upgraded, with perforations to help dissipate heat when worked hard, and the electric power steering has had a tweak to make it more direct in its sportiest mode. On the styling front, no box arches or wider tracks, sadly, but as a vague visual link with the racing car the GTI TCR does get what’s probably the pointiest front splitter VW could get past pedestrian impact requirements and a protruding rear diffuser, linked visually by blade-like side skirts. The tailgate-mounted rear spoiler is slightly bigger than standard, but modest in comparison with the racer’s aviation-spec wing. A bunch of hexagon-themed stickers, as pictured here, are an option, as are a choice of 19-inch wheel designs (18s are standard). Depending on which option pack you go for, stickier Michelin Cup 2 tyres can be fitted if you wish. The electronic limiter has been removed too, upping top speed from 155mph to 164mph. What about inside? Some racy bucket seats? The same super-comfortable sports seats as the regular GTI, with new alcantara and cloth upholstery trimmed in a jazzier type of tartan. The steering wheel has a motorsport-style red 12 o’clock marker (trimmed in very un-motorsport-like leather). but that’s about it really, save for some Alcantara on the door cards and gearlever gaiter. Otherwise it’s relaxing, ergonomically sound GTI business as usual. What’s it like to drive on the road? In its core driving modes (Eco, Comfort and Normal) it feels very, well, Golf-y. Quiet and refined on the motorway, and smooth riding on bumpy roads (our test car was fitted with the optional DCC adaptive dampers and 19-inch wheels). In the damper’s firmest setting, the ride becomes naturally firmer, and the car resists body roll commendably well. The steering becomes much sharper in response, and is easily the best steer in the Golf range, but remains relatively numb-feeling. The locking diff function is relatively subtle in operation but works extremely well, finding plenty of traction, although like all powerful front-wheel drive cars a patient right foot is essential with the traction control disabled. It’s impressively planted and composed at all speeds, even in the wet, and on an unfamiliar road it’s a car you’d be glad to have on your side. I’d hesitate to call it exciting – a Honda Civic Type R, Hyundai i30N or Renault Megane R.S. are all more thrilling drives, although none of them feel as urbane and unruffled as the Golf. Similarly grippy and planted, especially on the option Cup 2 rubber. 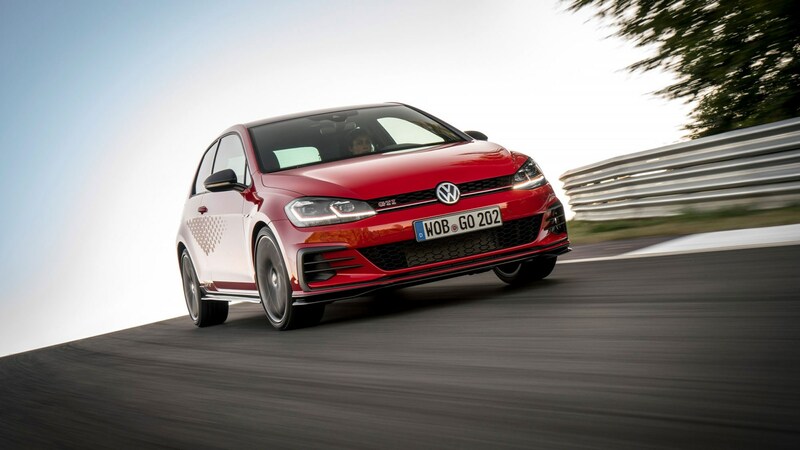 The stability and traction control systems are very well calibrated, so unobtrusive in their intervention you barely feel them at work, partly because they don’t need to work too hard – the Golf is relatively vice-free. It’s particularly stable under braking, and the uprated discs’ stopping power impressed during our admittedly short allotted session. The considerable 280lb ft torque output is spread very wide, between 1800 and 5300rpm, meaning the Golf always punches well out of slow corners and feels plenty muscular on both the road too. How much is the VW Golf GTI TCR? Prices begin at £35,305, but start adding a few choice options and it won’t be long before one costs more than £40k. On the one hand, that leaves this two-wheel drive TCR uncomfortably close to the all-weather performing R – you can have one of those with metallic paint, upgraded 19-inch wheels and £3,000 Akrapovic exhaust for similar money – but if you’re on the market for a £40k hotted-up Golf, you’re pretty much spoilt for choice. The Golf R leaps ahead with its all-wheel drive traction but the TCR steers and stops better thanks to the uprated brakes and lighter weight. In terms of rivals, the Honda Civic Type R currently costs £31,525 to £33,525, the Hyundai i30N Performance £28,760, and the Renault Megane R.S. starts below £30k but costs something in the low-30s once optioned with the Cup-spec limited-slip diff and lower suspension, and optional auto gearbox to make it an equivalent buy to the Golf TCR. Both the Civic and i30N are manual-only. This is an adept and likeable hot hatch with a broad spread of talents – just like the regular Golf GTI Performance. But in the cold light of day it doesn’t feel like a big step up for the price. It’s faster, and handles ever so slightly more sharply than the Performance but, based on this first test, it doesn’t feel enough of a cut above its sister car to justify its strong price tag. It makes total sense for VW to create a GTI road car with a marketing link to its worldwide touring car racing cousin, but this car feels more like a GTI Performance ‘Plus’ than a road car with an authentic TCR link other than its extra power and badges. If you’re in search of a touring car experience for the road, the Honda Civic Type R looks more like a racing car (if that’s what you want) and is more exciting to drive than the Golf TCR – as is the fantastic Golf Clubsport S, if you’re lucky enough to find one second-hand. This final TCR model is a nice send-off for the Mk7 Golf before it heads for retirement and, for one of us at least, it’s almost what the Golf GTI should always have been. It can handle the added power and – side decals aside - looks more exciting, while remaining tasteful. It’s hard to overlook the already-excellent Golf GTI Performance though, which offers a similarly fun-to-drive experience in a more affordable package.